For active participation and in recognizance of their best performace in the Digital India Week from 1st to 7th, July 2015, a selection committee at DeitY selected three districts - Baksa, Darrang and Kamrup as the 1st, 2nd and 3rd prize winners respectively from Assam. 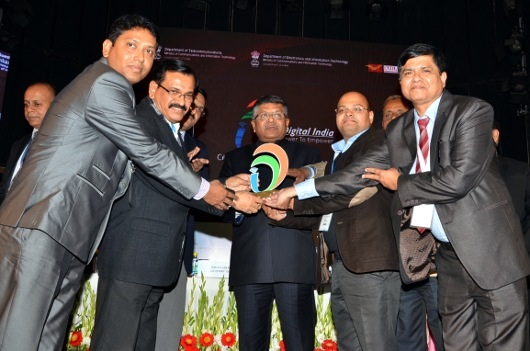 The awards were given by Hon’ble Minister of Communications & IT, Shri Ravi Shankar Prasad on "Good Governance Day" during the Digital India Award distribution function, held on 28th December, 2015 at Stain Auditorium, India Habitat Centre, New Delhi. NIC representatives Mridul Deka from Baksa, Subrata Saha from Darrang and Dipak Malla Buzarbaruah from Kamrup received the awards. © 2001-2012 National Informatics Centre, Assam State Centre, Guwahati.